Two police officers were assaulted by two men yesterday at 5:45pm during a traffic apprehension. Detective Senior Constable Jamie Mawhinney says the incident occurred at a service station on Dalgety Road. The officers stopped a blue Holden Commodore and arrested the driver for traffic offences. “The man resisted police and assaulted one of the officers. During the struggle, a second unknown man assaulted the other officer. Both offenders then fled the scene. “Both officers were treated for minor injuries,” says Det Mawhinney. 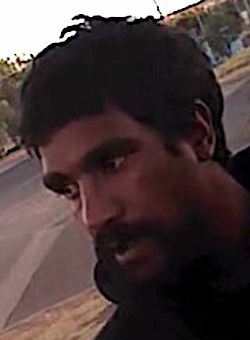 “One of the offenders (pictured) is described as an indigenous male aged in his mid 20s, medium build, short hair and was wearing a black Everlast hooded jumper. Anyone with any information is urged to contact police on 131 444 or Crime Stoppers on 1800 333 000.